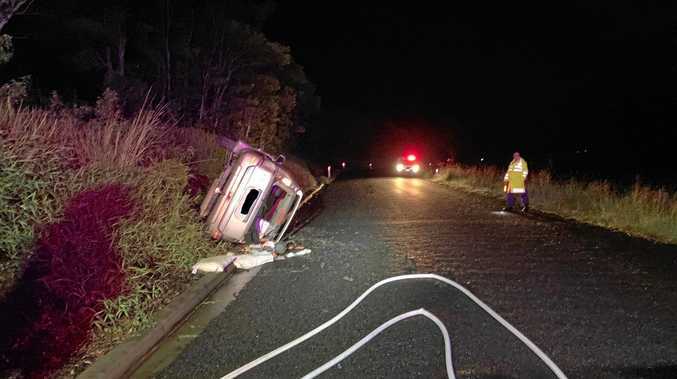 MEMBERS of the Newrybar Rural Fire Brigade joined local police at a single-vehicle car crash on Midgen Flat Rd late on Sunday night. Rural Fire Service NSW Far North Coast Team assistant district officer, Aaron Howard, said firefighters were at the scene of the incident around 10:30pm on April 14. "A New South Wales Rural Fire Service tanker from Newrybar Rural Fire Brigade responded to incident with NSW Police,” he said. "On scene found one small SUV on its side on the edge of the roadway. Mr Howard said firefighters provided fire protection for the incident, assisted with vehicle recovery and clean up. On their Facebook site the brigade asked people to take extra care. "Please drive carefully on the wet roads over these Easter holidays,” the brigade posted.